Some members of the working groups trying to come up with new education standards for Missouri schools tell the state Board of Education there are still some disagreements on the best way for them to work. 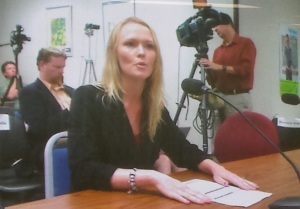 Jessica Boyster and others who testified to the State Board of Education about the efforts of work groups creating new Missouri education standards were shown on monitors in an overflow room because of the large number of interested Missourians who attended the meeting. Some are still expressing frustration that facilitators from the Department of Education are working with their groups. Others say political agendas are standing in the way of real progress and honest work towards standards that will benefit children. Jessica Boyster is on one of those work groups, and doesn’t think the bill that created them intended for those facilitators to be involved. State Board President Peter Herschend thinks meetings will run better with a moderator involved. Pam Hedgepeth was to have been one of those facilitators, but says she has been shut out of the process. Most groups say they are still using the facilitators in some way. Several work groups expressed concerns about some of their appointed members not showing up, and the costs to attend each meeting piling up for those that do show up. Herschend says there’s nothing the Board can do about those problems. The groups’ recommendations could range from the creation of all new standards to staying with the Common Core standards, which are currently in place. Herschend anticipates some proposed changes. Those groups must present their proposals by October, 2015.